LAST UPDATED (16:40 pm) – A powerful earthquake that hit Pakistan’s southwest province of Balochistan on Tuesday afternoon has killed at least 328 people, according to local officials. Pakistan’s chief meteorologist and the US Geological Survey put the magnitude of the earthquake that struck at 4:29 pm local time at 7.7 on the Richter scale. The large earthquake flattened hundreds of houses in the province. More than 500 people have been left injured by the 7.7 magnitude quake, said a Balochistan government spokesperson on Wednesday evening. The district of Awaran was worst-hit by the earthquake where an estimated 90 per cent of houses have been destroyed. “Almost all the mud houses have collapsed. We have been busy in rescue efforts for the whole night and fear we will recover more dead bodies from under the rubble during daylight,” said local government official Abdul Rasheed Baluch on Wednesday morning. 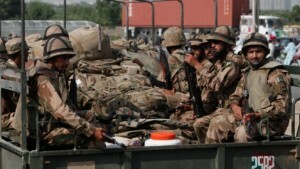 The Pakistani Army has sent a total of 1,600 army soldiers to the quake-hit areas to aid rescue operations. An army statement said 7,000 kg of food, 1,000 kg of medical supplies and 200 tents have been distributed among those affected by the disaster. The power of the earthquake caused the seabed to rise and created a small island close to the Arabian Sea coastline. Aftershocks were felt as far away as Karachi and in the Indian capital of Delhi. The country’s provincial government has announced it will allocate a budget of about $1.6 million for disaster relief. Chinese President Xi Jinping on Wednesday sent a message of condolence to his Pakistani counterpart Mamnoon Hussain and said he was “convinced that under the leadership of Mr President and the Pakistani government, the Pakistani people can unite to overcome difficulties, get over the disaster and rebuild their homes”. China’s Premier Li Keqiang also sent a message to Pakistani Prime Minister Nawaz Sharif to express deep sympathy over the casualties and destruction caused by Tuesday’s earthquake. The premier added that China is willing to provide emergency aid to Pakistan. The Pakistani prime minister is currently in New York for the United Nations General Assembly (UNGA) session.